The Brooklyn Nets have delivered plenty of memorable moments that their fans will remember for generations to come. Let’s take a look at some of them. On the Road to the NBA Finals – The Brooklyn Nets were outstanding in the 2001-02 season. That year, the team qualified for the postseason and won the Conference Semifinals and Finals by defeating the Charlotte Hornets, 4-1 and the Boston Celtics, 4-2 respectively. They later crossed paths with the Los Angeles Lakers for the NBA Championship. Unfortunately, the team couldn’t get past them and lost the bout, 4-0. The Brooklyn Nets have intense rivalries with the likes of the New York Knicks and the Toronto Raptors. Nets-Knicks Rivalry – The rivalry between the Brooklyn Nets and the New York Knicks started in 1976 when the former joined the NBA as part of the ABA-NBA merger. The media outlets have dubbed this rivalry, ‘Battle of the Boroughs’ or ‘Clash of the Boroughs’ due to the close proximity of both teams and the overall history of Brooklyn and Manhattan. In addition, these two sides compete in Atlantic Division of the Eastern Conference which adds fuel to the fire. Nets-Raptors Rivalry – The Brooklyn Nets and the Toronto Raptors became rivals when Vince Carter was traded to the Nets on December 17, 2004. This trade created the big three of Richard Jefferson, Vince Carter and Jason Kidd in Brooklyn. Since then, these two teams have developed a rivalry which got more intense when the Nets defeated the Raptors in the first round of the playoffs, 4-3 in the 2013-14 season. A Net ticket gets you inside this brand new state of the art facility in the heart of Brooklyn. Opened in 2012, the Barclays Center provides fans with a first class game-day experience and being situated in the heart of Brooklyn makes it very easy to access the amenities of New York City and Brooklyn before and after Nets' games.The Barclays Center is a multi-purpose indoor arena. It is not just the home of the Brooklyn Nets, but the New York Islanders of the National Hockey League also play their home games there. The Nets have had plenty of star players on their roster. A few, Bob McAdoo, Mel Daniels, Rick Berry and Nate Archibald have been inducted into the Brooklyn Nets Hall of Fame. It is also important to mention Buck Williams here. He remained with Nets from 1981 to 1989. During this time, Buck was selected to appear in three NBA All-Star Games in 1982, 1983 and 1986. He also received the NBA Rookie of the Year Award in 1982. In addition, the Brooklyn Nets honored him by retiring his number 52 on April 11, 1999. Then there is Derrick Coleman who joined the Brooklyn Nets in 1990. He remained with the team till 1995. While he was part of the Nets, he was picked to play in the NBA All-Star Game in 1994. Moreover, he was selected in the NBA All-Rookie First Team in 1991. Derrick also won the Big East Conference Men's Basketball Player of the Year Award in 1990. The Brooklyn Nets failed to qualify for the playoffs in the 2017-18 season. The team is now gearing up for the 2018-19 campaign. The Nets currently have talented players like Jahlil Okafor, D'Angelo Russell, and Jeremy Lin on their roster. So, who knows they might capture their first NBA Championship this time. But for that to happen, they need your support. So, get your Brooklyn Nets tickets 2018 now. Our process for purchasing cheap Brooklyn Nets tickets is simple and fast. 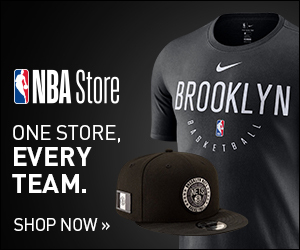 There are so many online ticketing sites, that it can be hard for customers to find the right place to buy Brooklyn Nets tickets at the cheapest price. At ScoreBig we think of our customers first and foremost. We offer daily deals for Brooklyn Nets events, so our customers can get the best seats for the best prices. ScoreBig will always go above and beyond to offer the cheapest Brooklyn Nets tickets on the market. The Brooklyn Nets schedule above, displays all available events for 2019 and 2020. Once you find the event that you would like to go to, click the red “Get Tickets” button. It is located on the right-hand side of the event listing, it will take you to an Brooklyn Nets event ticket page. ScoreBig's event ticket page will display all available Brooklyn Nets tickets for that event. On the event ticket page to help with your search for the right Brooklyn Nets tickets, use the filters at the top to select quantity, price range, and more. There is also an interactive seating chart so you can pick where you want to sit. When you are ready to buy a ticket, click on the listing, and you will be directed to ScoreBig's checkout page. Upon completion of the information fields, your order will be processed and your Brooklyn Nets tickets will be delivered via email, mail, or to your mobile device. What makes ScoreBig’s site stand out from the rest? We are constantly analyzing our competitors to improve our site, service, and prices. ScoreBig.com employees strive to offer the best process and experience to buy cheap Brooklyn Nets tickets. Our goal is to get you the best seats to Brooklyn Nets events. We offer daily discounts on our site and for special promotions check out our newsletter. If there are no Brooklyn Nets events currently available, you can use our search feature at the top of the page to see a list of all popular events going on near you. No matter your price point, we have all the best deals and discounts on Brooklyn Nets tickets. For more information on prices of Brooklyn Nets tickets and the schedule for Brooklyn Nets, check out our listings above. The last thing you want to find out is when the Brooklyn Nets event you wanted to go to is sold-out. Don’t worry in many cases ScoreBig has affordable tickets to sold out events. We sell tickets from GA all the way to premium seating and parking. Skip the scalpers in the parking lot and get your tickets online from top Brooklyn Nets ticket brokers. We get you in all events, buy your Brooklyn Nets tickets here from a brand that many trust and rely on for all their ticketing needs. ScoreBig offers a 100% money-back guarantee. If you have been in search of cheap tickets for Brooklyn Nets, ScoreBig by far is the best option. That’s why ScoreBig has more loyal customers than any other ticketing site. Shop at ScoreBig for safe and secure Brooklyn Nets event tickets.